Bestek wants to gift one of their fans with a brand new ice cream maker. 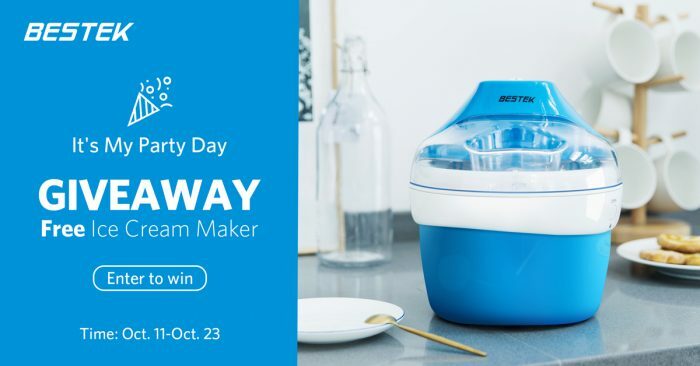 To enter in their latest Bestek Ice Cream Maker Giveaway grab your free entries by following few simple steps listed down below! The Cylinder must be brought to the required temperature by placing it in a freezer, the freezer must be regulated to a temperature of -18°C/0°F to -30°C/-22°F for frozen 11-16 hours. If the temperature is not reached, it will not be possible to use the cylinder to make ice cream. The ice cream mixture should be liquid when preparation starts. Does not use stiff mixture(i.e. whipped cream, frozen liquids). The time taken to obtain ice cream depends on the nature and quantity of ingredients used and temperature of the cylinder.The time taken to obtain ice cream depends on the nature and quantity of ingredients used and temperature of the cylinder. When the event has ended, we’ll email the winners on October 24th, 2018. GIVEAWAY END: October 23rd, 2018 at 23:59 PDT. OPEN TO: US, CA, UK, FR, DE, IT and ES.